Anthony Joshua didn’t even feature in the top-three despite having been the red-hot favourite. 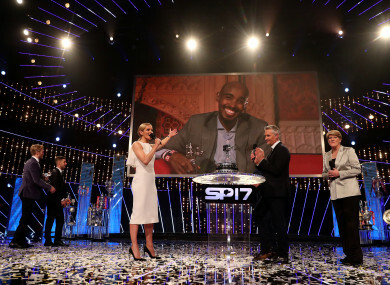 MO FARAH HAS surprisingly been crowned the 2017 BBC Sports Personality of the Year while red-hot favourite Anthony Joshua failed to even make the top-three. 34-year-old Farah claimed a third successive 10,000m World Championship gold medal in August while he also won a silver in the 5,000m before stepping away from track racing indefinitely later that month. The four-time Olympic champion will now concentrate on marathon running. World Superbike champion Jonathan Rea – who’s from Larne – was second in the voting while two-time Paralaympic champion Jonnie Peacock finished in third. Joshua, who got the better of Wladimir Klitschko in a heavyweight classic at Wembley in April and then retained his title against Carlos Takam in October – was in fourth. Despite being crowned world champion for the third successive time, Formula 1 driver Lewis Hamilton was in sixth. Farah had previously been shortlisted for the award on five previous occasions and finished third in the voting back in 2011. Email “Major upset as Mo Farah is crowned 2017 BBC Sports Personality of the Year ”. Feedback on “Major upset as Mo Farah is crowned 2017 BBC Sports Personality of the Year ”.